Trip Report - What a vacation in Belize looks like when you split time between San Pedro and Placencia! 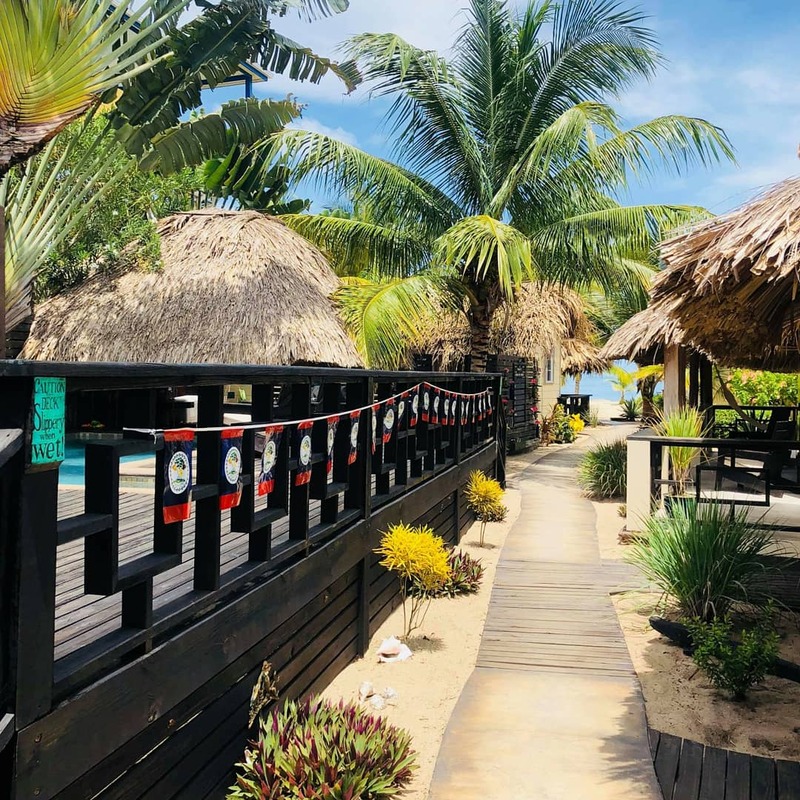 Since we have opened our second hotel in Belize, in San Pedro, we have had a lot of questions about what a vacation might look or feel like to do both San Pedro AND Placencia in one trip! We have had a number of guests book the package deal and thus far we are getting rave reviews, because Placencia and San Pedro are VERY different - they are like different countries. 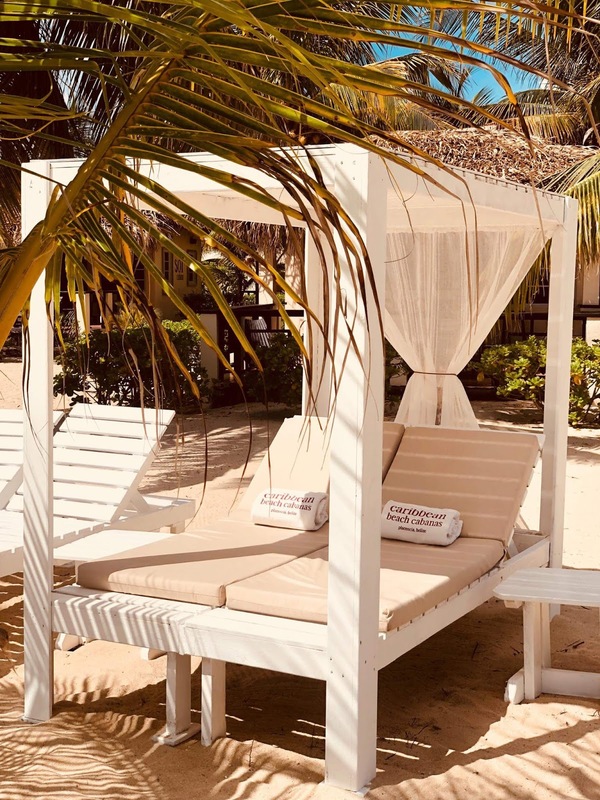 Recently, we had a group of two single women come down and do both (they started at PUR Boutique Cabanas in San Pedro, then went down to Caribbean Beach Cabanas in Placencia), and they offered to write a guest blog about their adventures here! 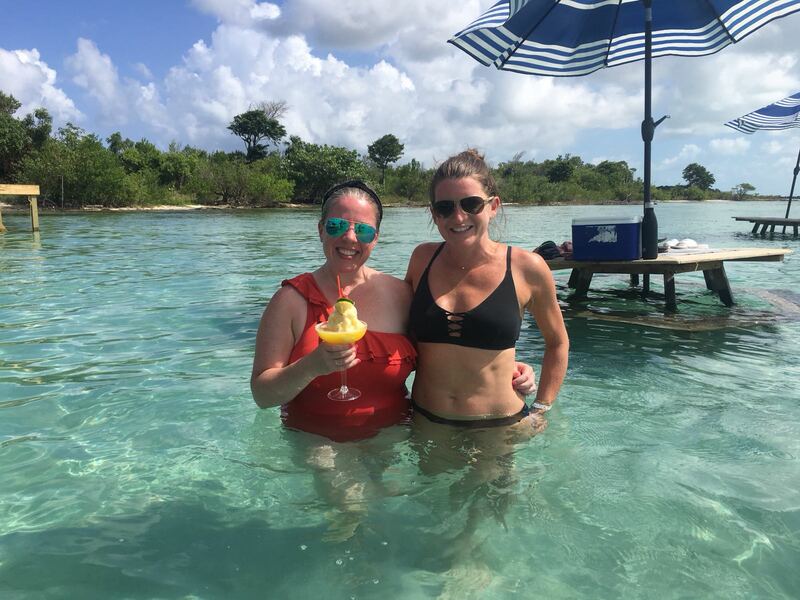 Two Cleveland Gals' adventures in Ambergris Caye, Caye Caulker and Placencia, Belize! 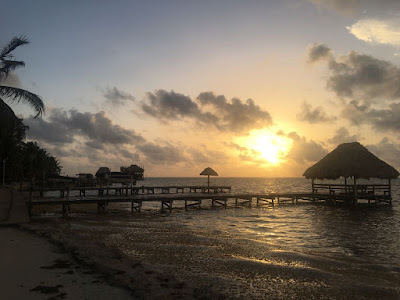 Day 1 – Arrive Ambergris Caye. Nelson from PUR picked us up at Maya Air in Ambergris Caye to take us to PUR with bottles of water and a cold towel, much appreciated after our flights. Nelson gave us a quick tour through the town and showed us some hot spots, where we could have a fun time. Then after a quick check in, we suited up and headed to Palapa Bar downtown on the beach. It was the perfect spot after traveling most of the morning. We stopped next door to Wayos. Nancy had a cheese quesadilla. They had great music and atmosphere. It was a perfect casual evening out. Day 2 – We slept in on our first full day. Such a treat! 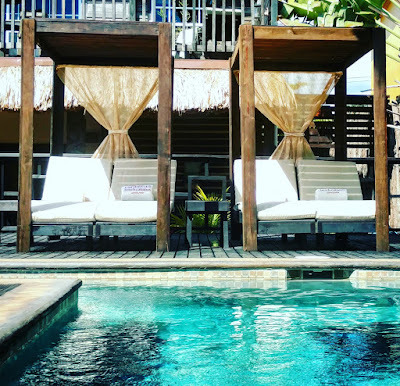 It was so nice to walk out of our cabana and have a poolside breakfast right at PUR. 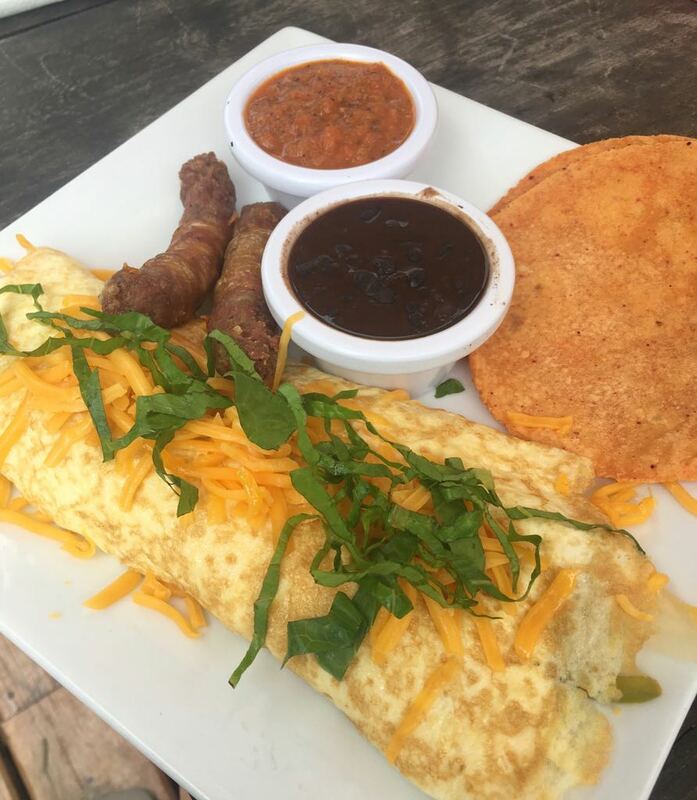 The omelet was AMAZING. We relaxed in the pool for a few hours and had a slow easy morning. Headed up north in the golf cart. It was a Monday which is a pretty slow day on the island. We spent a few hours at Pacos. Then stopped in Coco Beach. 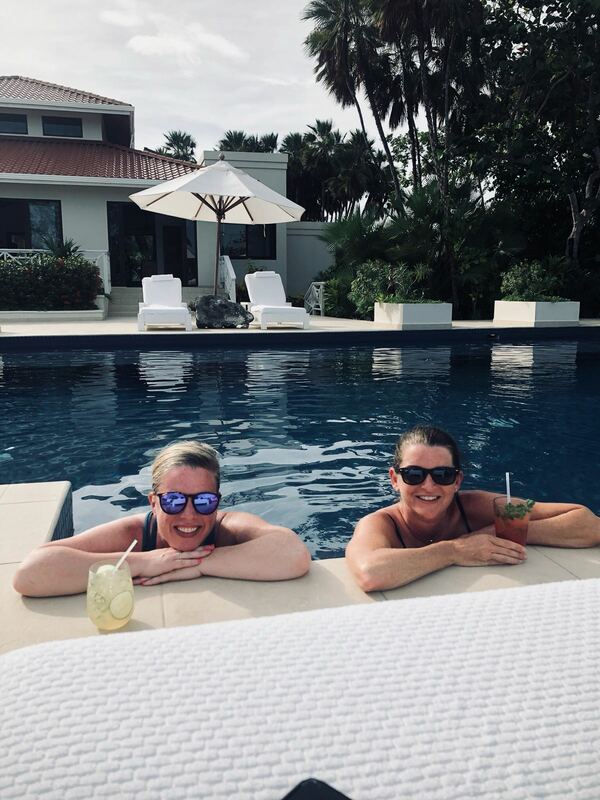 We weren’t able to use the pool, but had a cocktail and enjoyed the scenery. We headed back to PUR to change and freshen up then birthday-eve dinner at RAIN. Went to dinner around 5 so we would see the sunset at 6:25. It was pretty cloudy, so not a great sunset, but FABULOUS views. The food was excellent - ceviche & garlic lobster tail & tuna. They have some great wine choices, including Kim Crawford. Probably best wine menu on the island and they offer a cheese plate. A must do! We stayed North of the bridge all day. We ended the day at the casino at Captain Morgans, had an amazing, fun time at this tiny casino, lost a little $ but the local free drinks made that better. It was great to have $5min US tables for blackjack. You really got to know the dealers and other players because it was so intimate. It was great to drive a quick few minutes home to PUR! Day 3 – Tuesday – Shannon woke up early and walked down to the beach to enjoys the sunrise at around 5:45. After a slow walk up and down the beach, we had a quick breakfast at PUR before our excursion. We were picked up at PUR and headed downtown to snorkel Hol Chan & Shark Ray Alley. It was a ½ day excursion with plenty of time to snorkel. We saw amazing fish, sting ray, urchins, spikey things, tons of sharks, shells, beautiful coral and of course sharks. By 12:30, we were back at PUR and enjoyed a relaxing poolside lunch. Shannon had the taco bowl that was so good, and could have fed two people. 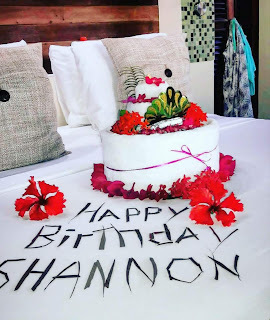 Shannon’s birthday celebration began with a clean room and a cute message from the staff. 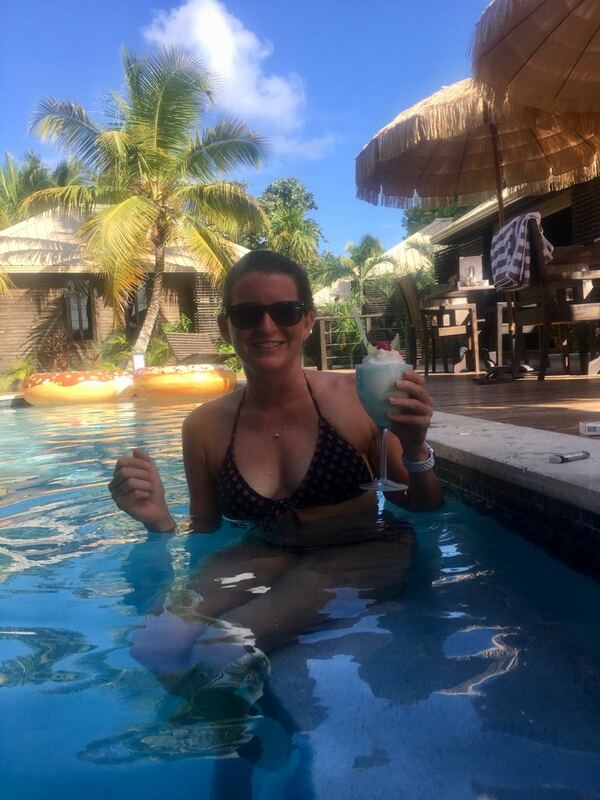 We were going out to dinner, so we had drinks at the pool at PUR and hung out with the other guests staying there. It was a really fun afternoon. Then off to Nook for dinner downtown. We all indulged on espresso martinis and enjoyed a singer on the patio during dinner. We were right on the water - everything was 5 stars, location, service, food and drinks! Off to the crab races at Crazy Canucks. We had to take the golf cart there from downtown, but we were right on the beach. Rob, a fellow Clevelander, owns the bar and has crab races on Tuesday night to raise money for local non-profits. For a few dollars each, we picked out crabs and named them. Rob did the announcing similar to a horserace. It was so fun and great energy. We won a $10 gift card to a local restaurant. They have given over $80,000 to local charities. After, we stopped back downtown at Melt for karaoke. Rashida and Kenny made us feel at home and Nancy sang a song before we left for home. Day 4 – Wednesday – Shannon headed to Akbol for yoga. They were doing a special yoga practice that was almost 2 hours long. It was amazing. Very relaxing and as a beginner, I felt very comfortable. Kirsten walked around and made sure everyone was doing things right and was encouraging everyone to go at their own pace. After, they welcomed everyone to say and meditate. After 2 hours of yoga, I was good, but the offer was nice. Nancy had breakfast at Akbol and enjoyed relaxing on the hammocks. Then off to Secret Beach – it took about 40 minutes in the golf cart. It was a very scenic ride with a lot of undeveloped properties and waterways with mangroves, etc. There are a lot of bars right by the parking lot when you arrive, but we went the trail to the left to the Blue Bayou. They had picnic tables in the water with a server delivering your drinks. It was excellent service and scenery. We had tacos & chips and queso for lunch. Everything closes down around 6, so we headed back around 5 and stopped by Truck Stop. What a cool spot. Old shipping containers contained a pizza shop, taco shop, southeast asian cuisine, and ice cream. They also play movies on the lagoon, had a great pool, checkers, and other games. It was another full north of the bridge day. Day 5 – Thursday – We walked about to have breakfast at Marbucks (turn left out of the property – about an 5 minute walk). We had the quiche and bagel sandwich. Definitely try this one morning. It’s a small spot with just a few tables, and a good vibe on the sand road at the back of the PUR. 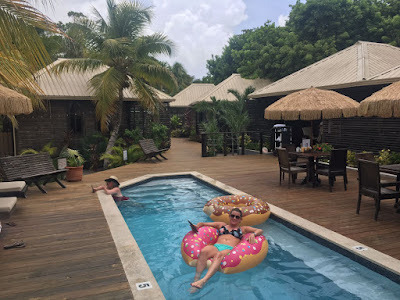 We turned back to PUR for a few hours in the pool before heading to Caye Caulker. That morning we met up with friends at Dive Bar (also north of the bridge). 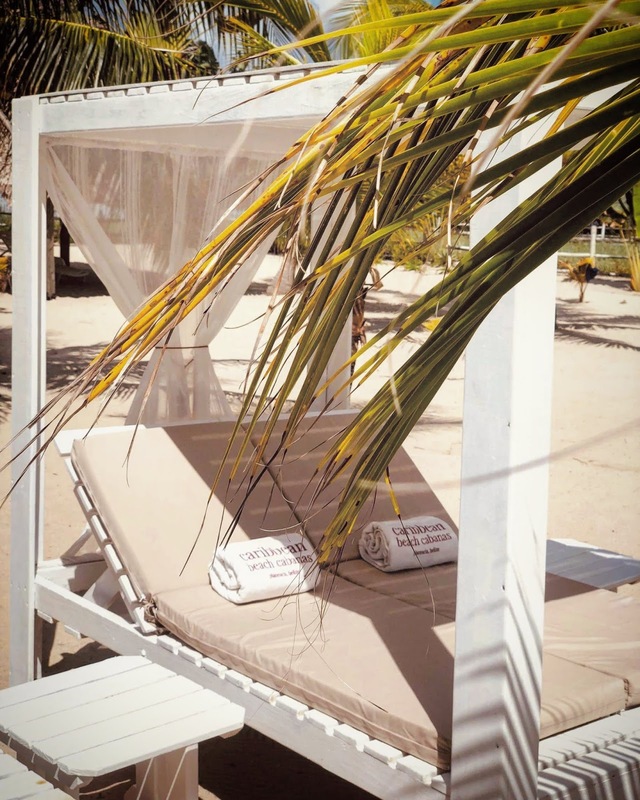 It was a great spot…we didn’t stay long but they had hammocks, lounge chairs and great beach. We then took a 25-minute boat ride to Caye Caulker with a quick stop at Koko King – must do. 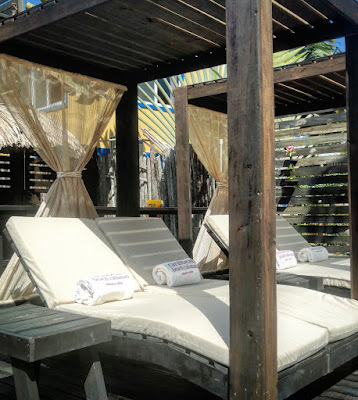 (They have a free water taxi from Koko King to Caye Caulker). Walked around, had lunch at the Split. While at Caye Caulker the rain came in (we were there during rainy season). It poured rain for about 10 minutes but after, besides a few puddles, you wouldn’t have known it rained. 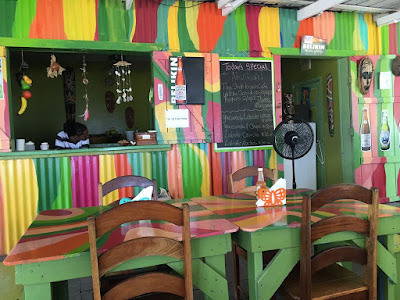 We took a quick ferry back to Ambergris Caye and headed straight to the chicken drop at Wahoo's. What an experience. We were there early to purchase our tickets. They had about 6 “drops” a night. After everyone purchases their tickets, the winner is chosen by where the chicken “drops” (poops) on the board. What a trip! We had lucky 35 and won! We were back at PUR around 11, yes it was a late night, and the security officer on the resort showed Nancy an anteater in the tree. We (quietly) relaxed by the pool for a bit, unwinding before bed. Day 6 – Friday – We were off to Placencia. Nelson took us back to the airport, with a drive on the beach, one last time, and we relaxed in the air-conditioned lounge for 30 minutes before boarding our flight. After a quick stop at the municipal airport, we were picked up by Mr. Dave in Placencia. CBC was just reopening after construction. Many updates happened to the cabanas, casita and the villas. They now have amazing beach beds and everything was freshly restained/painted. From CBC we took a quick walk down the sidewalk to Barefoot Bar and had a delicious lunch with frozen fresh fruit mojitos and margaritas. We returned to CBC for a late afternoon swim in the pool. It was such a relaxing chill day. 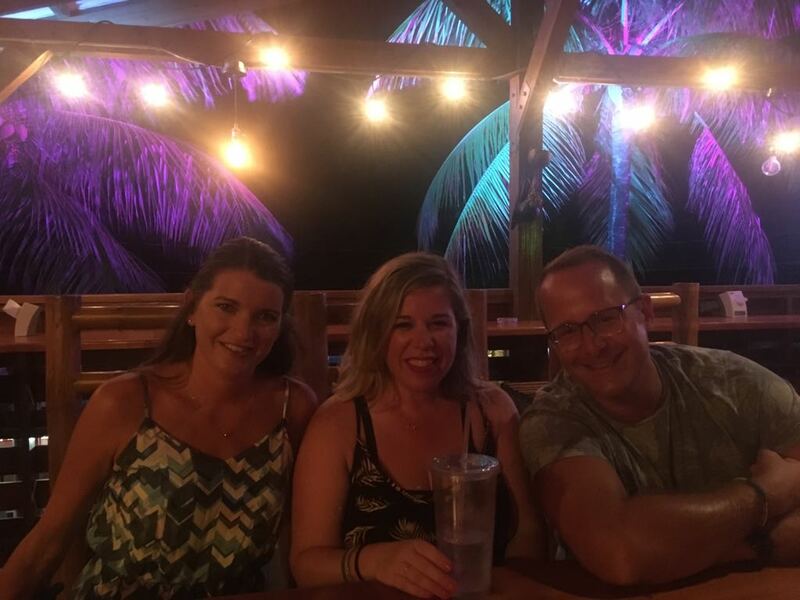 We ended our evening back at Barefoot Bar for a light dinner. 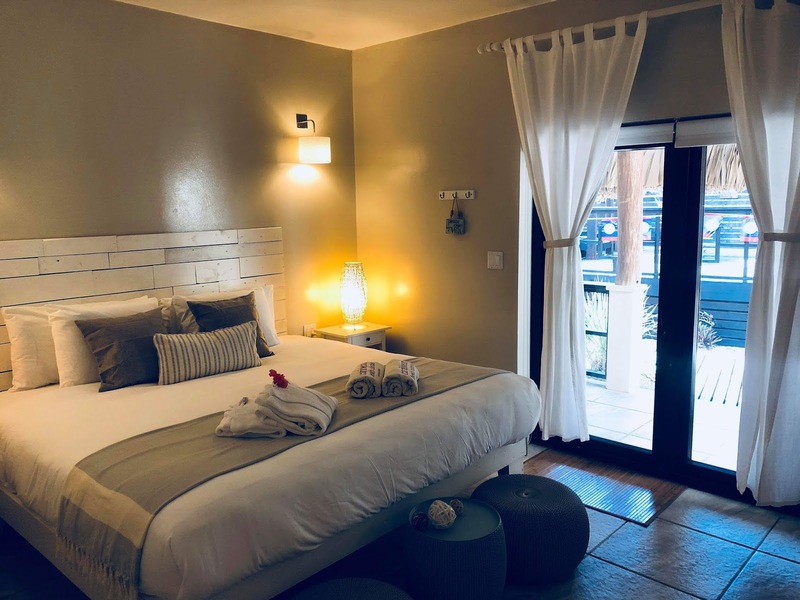 Barefoot will pull you back in again and again during your trip, it really feels like the heart of town and is always warm and welcoming. Placencia in low season is a bit hit and miss with what's open but there was plenty to do every night - we enjoyed being able to meet and talk to more people since the atmosphere was more intimate - we felt special because there weren't THAT many tourists in the village, never crowds, and the beach to ourselves most days! It was such a great change from San Pedro, where it was pretty crowded and crazy, and we felt so tranquil and relaxed during our time in Placencia. 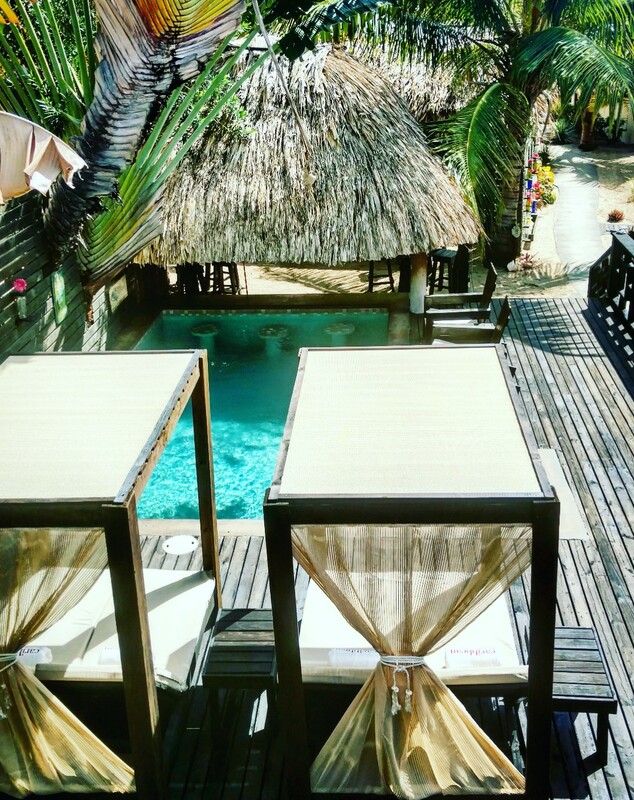 I recommend people doing San Pedro first if you can, so you can rejuvenate in Placencia before you head home. 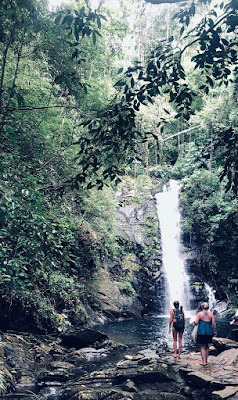 Day 7 – More adventures! We headed up north to the Waterfalls at Maya King. We stopped on the way at Maya Bistro. The food is fantastic and they have espresso martinis ☺. They have a pool on-site and being right on the water it is picturesque. They are not in the village, but a fun place to visit for a meal. Took a drive up to the waterfalls. For about $10 US we were able to drive up the mountain and explore. There were bathrooms on site and the paths were clear and easy to navigate. The pictures sell it. On the way back, we popped into a few resorts for cocktails and snacks in the Maya Beach area (this is about a 20 minute ride from the village). Belize Ocean Club, Naia and Turtle Inn (this is closer to the village). 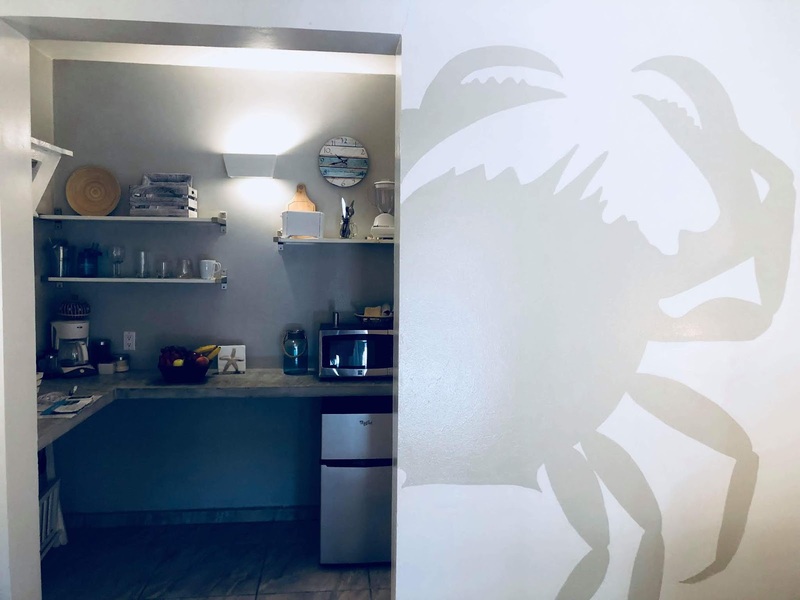 With the exception of Turtle Inn, we were able to enjoy the amenities of each resort as long as we purchased food and/or drinks. That evening we walked into the village for some live music at Cha Chi's. Shannon had ceviche (again), and Nancy and our friends all had pizza. It was very good New York style pizza, sold by the slice or the whole pie. This is a new place in the village and worth the stop. 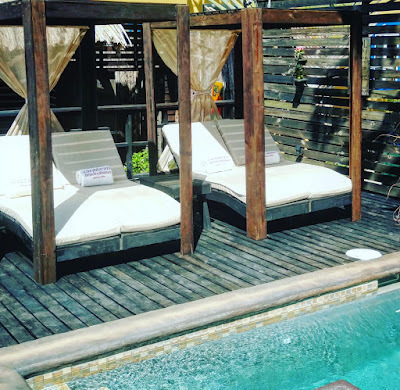 Day 8 – RELAXING! We walked down for breakfast at Cozy Corner (because De tatch…Shannon’s favorite, was closed for low season). Had a very relaxing breakfast. It’s always best to not be in a hurry because service can be slow. Then we walked the entire village stopping into souvenir shops, jewelry stores, and art galleries. 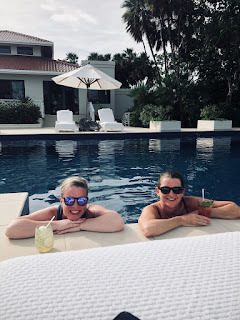 We finished our day relaxing by the pool at CBC and had a wonderful cookout with friends. 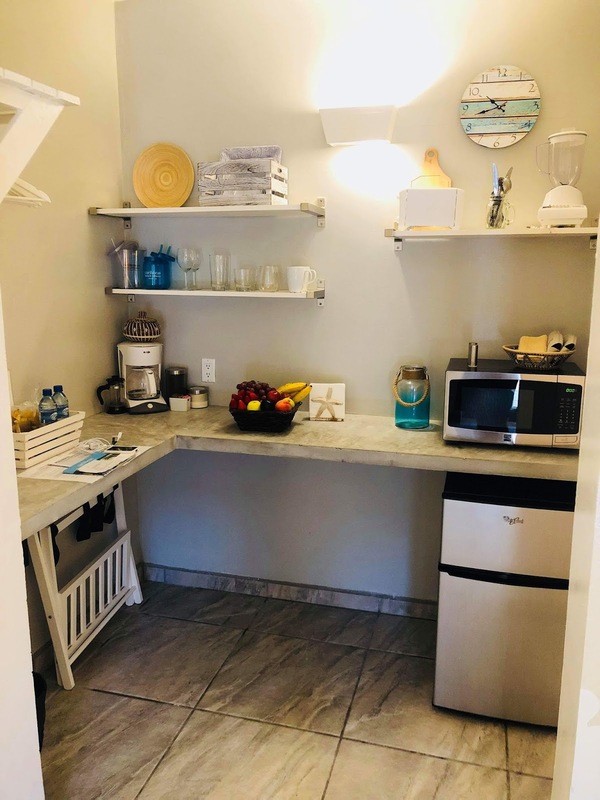 There is a gas grill onsite for guest use. The grocery store nearby has everything you need for a beachside BBQ. The pool at CBC is perfect for a boutique hotel, it is really welcoming and comfortable, just big enough and the right temperature to hang out for hours. You can hang under a huge palapa roof in the shade or in the pool on stools. 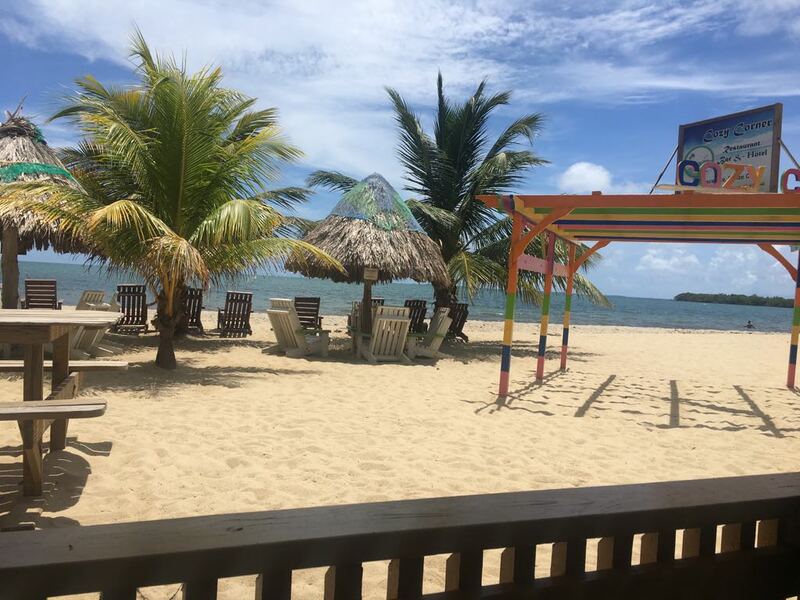 Day 9 – Last full day in Belize. We walked through the village to the pier to have breakfast at the Shak. This is also a must visit. They have a great variety and it fun to people watch at the pier. We were back at CBC before noon and just relaxed and laid out. In the afternoon we shared a bottle (or two) of wine we had picked up from the duty-free shop at the airport. Man, that was really living. We walked to Rumfish for dinner (best dinner per Shannon)! Shannon had a filet, lobster tail, brussell sprouts and potatoes for $55 BZ ($27.50 US). This dinner in Cleveland could cost nothing less than $60US and it was wonderful. 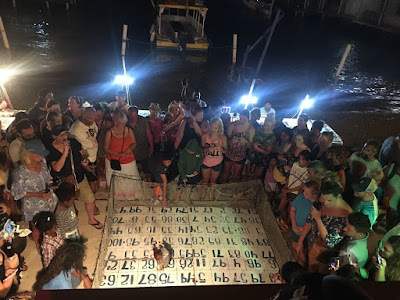 We stopped by Barefoot Bar for a night cap and ran into some friends we made in Ambergris. It really is a small country. It was a great way to end the trip. 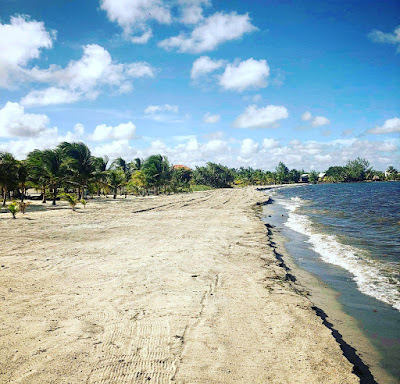 Day 10 – Travel ☹ Mr. Dave dropped us off at the Placencia airport and we took the trek home. 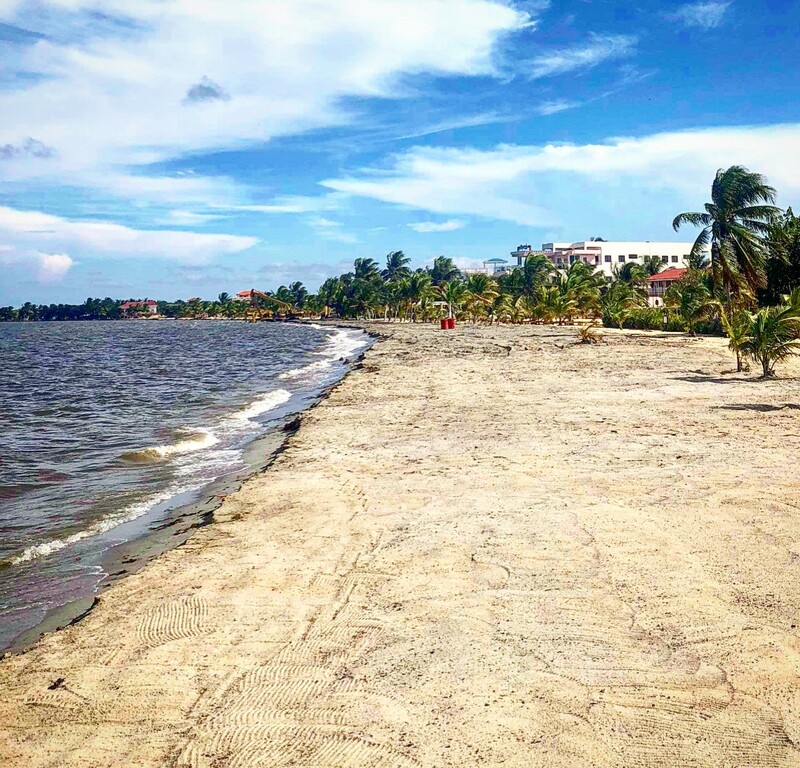 **Note that in Placencia, we could have done any number of excursions, but I really just wanted to relax. I wanted to stay on my cushioned lounger on my veranda, lay out, look at the sea, get in the pool a bit, maybe paddleboard or kayak a bit from CBC's beach. I have been to Placencia before and have done Cockscomb, Monkey River, and Laughingbird Caye. These were all amazing, and I highly recommend people that haven't been here before take at least an excursion or two. We also wanted to do Ranguana Caye this trip, but we weren't able to because they weren't going the days we were there - next time!! Although September is low season, one of the highlights of the low season is Independence Day - September 21st! This year was 37 years for Belize as an independent country. The country takes its celebration very seriously! The party starts at the beginning of the month with St. George's Caye Day and continues through the month. You'll see streamers, flags, and national pride everywhere. The party started in Placencia overnight on the 20th/early the 21st at "jouvert" (large party) which was an overnight parade and fireworks! And then the afternoon parade in Placencia! It starts a couple miles north of the village, and the parade walks all the way through town, where the party ensues into the night! Many of the locals start making their floats and costumes months ahead of time. 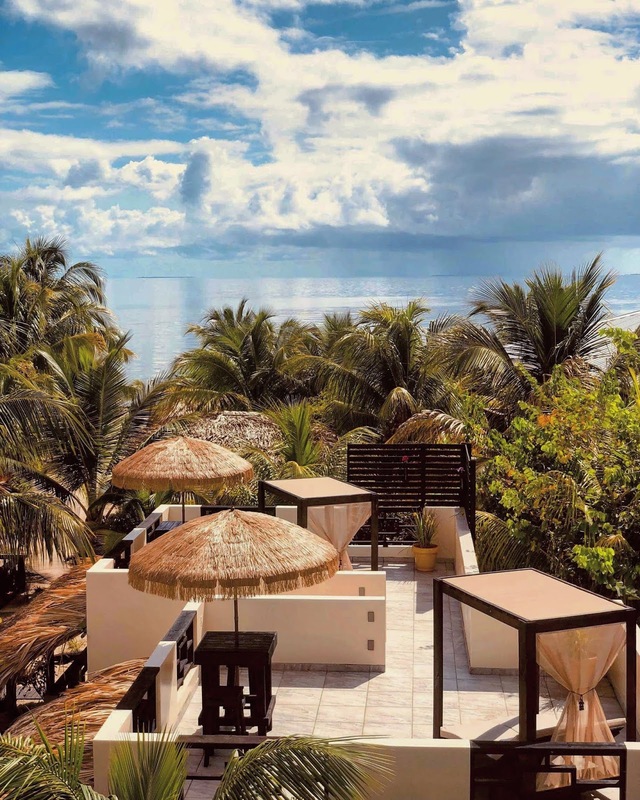 This is a spectacular time to be in Belize, so make your plans for next year!!! CBC's 2018 reno's and the Sargassum invasion!!!! and here is how the beach looked when we reopened (3 days ago)!!!! 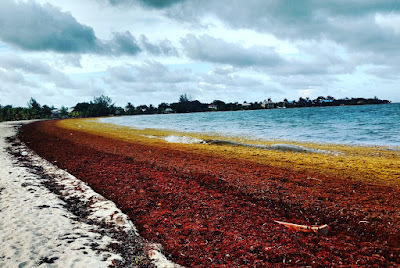 Please note, the normal amount of sargassum, while unpredictable, doesn't have to change your plans to travel here and CERTAINLY doesn't need to ruin your trip. 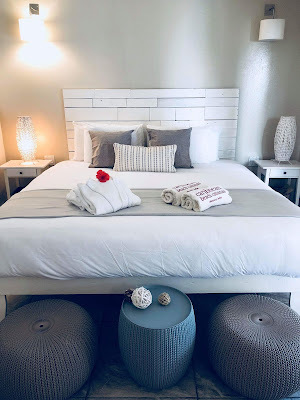 There is a bit of "seaweed aromatherapy" in the air at times, and you may have to step over some seaweed in the water, but there is PLENTY to do here even if the seaweed is a nuisance. 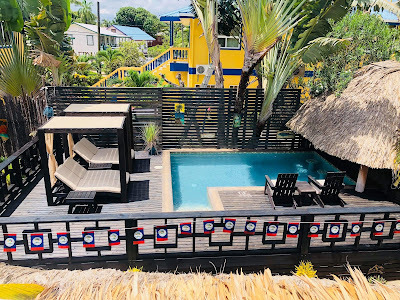 We have not had ONE guest say their trip was ruined in all these months; in fact, most are planning their second trip here. The experience here is the village itself and that isn't going anywhere :)! Here are some fun pictures of some of the new beach beds around CBC!!! We are SO thrilled to be reopened and we love to have our guests back to enjoy the new stuff here! 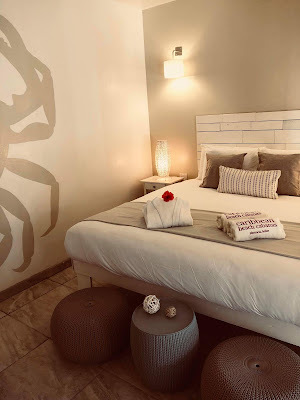 Villa Playa and Mar got a little love this rehab, with new king beds and decor! Casita also got a new floor and lots of love, next time we close down, it will be the cabanas turn! We have a couple more months of low season, where we will keep our fingers crossed we stay lucky this hurricane season. So far, so good!